George Graham Reviews John Mayer's "Room for Squares"
Singer-songwriters come in various stripes. There are those who are basically wordsmiths and whose musical compositions are much less of a focus, there are others who started out as impressive musicians and gravitated into writing songs to have some material to play, and there are those who combine strength in both areas. This week we have an album from a singer-songwriter who started out as a bit of a guitar flash, but then found creating and performing his own songs more satisfying, though his focus on musicianship and musical content of his compositions remains a strength. He is John Mayer, and his new CD, actually his second, is called Room for Squares. Twenty three year old John Mayer grew up in Connecticut, where after youthful immersion in typical commercial radio fare, he discovered the blues-rock of Stevie Ray Vaughan from a tape given to him by a friend when he was thirteen. That was his moment of Epiphany, as often happens for many musicians. He soon took up the guitar and while still in high school was already winning fans for his guitar work in regional blues clubs. But he came to realize that trying to be the fastest or most virtuosic blues guitar slinger was not what he wanted to do, and began turning toward songwriting, eventually enrolling at 19 at the Berklee College of Music in Boston, though he did not stay very long. He said he was more interested in playing music than studying it, and decided to move to Atlanta at the recommendation of a friend. There he began to develop a following from his frequent appearances at various venues there, and by 1999, recorded an independent, mostly acoustic CD. 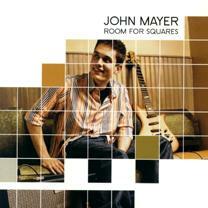 The following year, at a music conference in Austin, Texas, Mayer caught the ear of the major labels, and signed with one of them to record what would become his new release Room for Squares, whose title was based on a classic jazz album by saxophonist Hank Mobley called No Room for Squares. With a major-label budget, producer John Alagia, known for his work with the Dave Matthews Band and Ben Folds Five, was brought in for a series of sessions that were done in Maryland, Woodstock and Brooklyn, NY, Nashville and Los Angeles. The result is an appealing album that combines a good energy level, with astute songwriting that is tuneful, musically interesting and lyrically optimistic, with hints of jazzy undercurrents. Mayer himself is a likeable vocalist who sounds like a cross between Dave Matthews, some of whose mannerisms Mayer can assume, and Michael Franks. His album is a nice blend of distinctly contemporary elements, with some of the enduring values of good songwriting. He is joined on the CD by a regular band including bassist David LaBruyere, who tours with Mayer, plus drummer Nir Zidkiyahu who has performed with Genesis and Alana Davis. Producer Alagia also appears on various instruments. The sound of the arrangements often has timeless qualty, relying on rather classic electric guitar sounds, a good deal of acoustic guitar, plus the textures of Hammond organs, Rhodes electric pianos and the like, the latter often played by Brandon Bush. Mayer definitely conveys his youthful perspective in many of his songs, with love being a frequent topic, and his viewpoint is one of enthusiasm. One piece tries to be nostalgic about being six years old. But he's articulate, and these are songs that are anything but depressing. John Mayer's new CD Room for Squares is a worthy effort that blends elements of singer-songwriter fare with melodic pop, and often interesting musical stylistic ingredients. Mayer is a perspicacious songwriter whose outlook is most often full of an infectious youthful enthusiasm, who boasts an amiable vocal style, surrounds himself with tasteful backing musicians, and is himself a worthy guitarist and multi-instrumentalist. About the only quibble might be that occasionally his vocals can sound enough like Dave Matthews that he could be accused of imitation, but that is a minority of the time. Sonically, we'll give the CD about a B-minus. Though the CD makes a good car-radio pop album, on a good sound system, flaws like the rather thin recorded sound of Mayer's vocals, and often heavily-compressed in-your-face sound that undermines the music's finer points, are drawbacks. The title of John Mayer's new CD begs the question, "Is there room for another singer-songwriter?" with the as field well-populated as it is. The answer from me is definitely yes, and at his young age, Mayer brings together a commendable combination of traits and strengths that could well lead to a durable career. (c) Copyright 2002 George D. Graham. All rights reseved.